Julian Chrysostomides, who died at the age of 80, encapsulated the old tradition of the devoted scholar and teacher. For her, knowledge and education, if pursued with selflessness, dedication and compassion, could be a remedy for the wrongs and evils of this world. As an historian she was fully aware that “a society without history cannot understand what it is doing; and history without scholarship cannot understand itself. For scholarship is just the understanding, the intimate understanding with imagination and with love, of the noblest things of the past: the great thoughts, writings, doings, aspirations, which still live, but live precariously, because they will die if they are not understood, die if they are not loved” (W.K.C. Guthrie, ‘People and Traditions’, in Tradition and Personal Achievement in Classical Antiquity, London 1960, p. 22). For more than forty years Julian Chrysostomides worked passionately towards this aim, inspiring generations of students at the University of London with her scholarship, integrity and humanity. “In their turn”, she remarked, “they taught me and made me think”. Born in Constantinople on 21 April 1928 (two years before the city was renamed Istanbul) Julian was educated at the Zappeion, the Greek Lyceum for Girls. Her mother, Victoria Rizas, a Phanariot, from whom Julian inherited her sensitivity, perseverance and love for beauty, remained a major influence in her life. Her father, Chrysostomos Chrysostomides, a Cappadocian enterpreneur, instilled Julian with the ideals of Greek Paideia. In 1950, with the Greek community under increasing pressure, she came to England to read Honour Mods. and Greats at Oxford, having found the Sorbonne less congenial. Later on she would describe, with a smile, her experience at her application having been turned down by St Hugh’s College, on the grounds that her English was poor, that she had no Latin, and very little classical Greek. She cried for a week. On reflection, she placed the letter of rejection among the pages of the Liddell & Scott, Greek-English Lexicon, and each time she turned the pages to trace words and their meanings, the letter would turn up as a reminder. Rather than being afraid to face realities, she armed herself with her characteristic determination. Julian explained to Iris what it meant for her to study her own Hellenic culture in England, where she felt free at last, and proud to be Greek. Iris felt admiration for Julian. Not only did she accept her to study at St Anne’s, but secured for her a modest bursary. For the next five decades they would remain close and loyal friends. Julian’s graduation from St Anne’s in 1955 coincided with the organised riots that led to the massive destruction of property and the loss of human lives among the Greek Community in Constantinople. “There is no good trying to live in a country in which, though ostensibly a citizen, one was hated so much,” she later remarked. Nevertheless, for Julian, Turks like the vali of the island of Antigone, who refused to allow the rioters to touch the Greeks, became models of dignity and humanity. Similarly, her firm stance against the Turkish occupation of northern Cyprus since 1974, publicly expressed in her letters to the press, did not prevent her from readily ‘adopting’ Turkish students who arrived in Britain to study the ancient and medieval Greek history and culture. In those days, however, it became clear to Julian that there was no future in Turkey for her. With no hesitation she adopted Britain as her new country and in return Britain adopted Julian as her citizen. With the support of Iris Murdoch she secured naturalisation without delay. Supported by a Tutorial Studentship, Julian pursued her BLitt. at Royal Holloway under Professor Hussey. She chose to study the scholar Emperor Manuel II Palaeologus (1391-1425) and his policy vis-à-vis the Ottomans, which in turn led her to research in Venetian documents, an incomparable source for Byzantine history, society and economy in the Palaeologan period. On completion of the first stage of her research, with the help of Iris Murdoch Julian secured a library post in the Society of Antiquaries. The experience she gained as an assistant librarian gave her a greater sense of discipline and order as well as an appreciation of the material aspects of books, especially of those returned damaged. She would never hesitate to gently reprimand students (and Lecturers) who made notes in ink on borrowed books. In 1963 Julian was awarded a Virginia Gildersleeve Fellowship by the International Federation of University Women which enabled her to pursue further research in the Venetian Archives, while the then Registrar at Royal Holloway, Miss J. Fuller, was able to secure another grant for her. Julian would later on describe her amazement on learning about the second award, for the simple reason that she knew nothing about it until that moment, as she had never applied for it. For her it confirmed her view that thoughtfulness, sensitivity, kindness, respect and generosity are essential aspects of the English psyche. “Such a gesture would have been unthinkable elsewhere!”. An accidental meeting with Father Raymond-Joseph Loenertz, the eminent Byzantinist, at the Archives of Venice, would leave an indelible mark on her approach towards scholarship. “I must confess this [lesson] was something that I was not very familiar with,” she would affirm. “For a better word, this was the brotherhood of scholars. Its message was simple: one should discuss with and communicate all you know on your subject to your fellow scholars; and if you come across a new source you should pass it on to them without reservation. You should always be ready to help” ― a principle she followed throughout her long academic career. Nothing demonstrates this better than the University of London Postgraduate Working Seminar on Editing Byzantine Texts, established by Julian Chrysostomides, Revd. Dr Joseph Munitiz, S.J., and Dr Athanasios Angelou in 1988, with the aim to bring together graduate students, University teachers and visiting scholars interested in editing texts from manuscripts. This Seminar, the only one of its kind in Britain, now part of the special areas Seminars hosted by the Institute of Historical Research, is still growing strong. In addition, many MA and research students, who had no official association with Royal Holloway, were the beneficiaries of Julian’s generous help, encouragement and guidance often, it should be said, at the expense of her own research. In 1965 Julian was appointed Lecturer in History at Royal Holloway, where she taught Byzantine history and Political theory for almost three decades. Her insistence that students should familiarize themselves with the sources in the original languages, and should be prepared to discuss their own views by a scrupulous examination and cross-examination of the evidence, was an essential element of her teaching. In approaching the text, she advised, one should always exercise critical thought but also sensitivity and imagination. 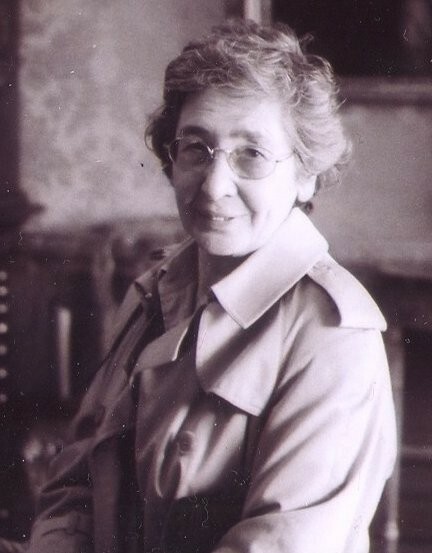 Joan Hussey had established and structured Byzantine studies for the BA degree in History in the University of London in 1950s, a system followed by Julian when she returned to Royal Holloway as a Lecturer. “It was … a return to a place I valued”, she remarked at a gathering in her honour in May 2003, “The History Department, in relation to what it is today, was a small one. We knew each other and there were daily occasions when we met and discussed, and became friends. The atmosphere was more placid; today’s obsession with funding, which sometimes runs the risk of being the only criterion, was not yet on the horizon. The principal aim was to teach our students to think, to examine, and evaluate. The arrival of Bedford College [with the merging of the two Colleges in 1985] added to the diversity and richness of our Department.” Later on she would strongly disapprove of the decision of the College to change its crest (adorned with Horace’s dictum Nil desperandum), replacing it with a modern logo “appropriate for super-market products”, and more importantly for adopting the name Royal Holloway for every-day use, for reasons of marketing, dropping Bedford out of the official name Royal Holloway and Bedford New College (appearing as such only in legal documents), which justifiably estranged many Bedfordians. Julian defended the view that Universities should maintain their purpose, character, history and tradition. They should resist becoming mere markets conditioned by demand and supply. For this reason she openly opposed the sale of three invaluable paintings in the original collection of Thomas Holloway (a Turner, a Gainsborough and a Constable), for she felt that in this way the College “sells its soul” ― not cheaply though; the selling brought to the College no less than £21 million for the upkeep of the magnificent Victorian Founder’s building at Egham. From the pedagogical point of view, she considered this sale gave a bad lesson to the young. Julian Chrysostomides’ co-operation with King’s College London remained a special one. Originally, she shared the undergraduate teaching of Byzantine history with the Late Professor Donald Nicol. The optional subject “Byzantium and Italy (518-1025)” and the special paper “Byzantium, Italy and the First Crusade (1025-1118)’ enjoyed great popularity among undergraduates of the University. In 1988, together with Professor Jonathan Riley-Smith, then Head of the History Department at Royal Holloway, and Dr Athanasios Angelou, Julian established the MA in Byzantine Studies, designed especially for those who are interested in progressing to doctoral research. This led to further co-operation with Professor Nicol’s successor, Dame Professor Averil Cameron, and Professor Charlotte Roueché, specialising in Late Antiquity and early Byzantium, which eventually led to the establishment of the MA in Late Antique and Byzantine Studies. Julian was a fervent supporter of the University of London federal system, which until quite recently remained uncontested. Over the last decade Julian observed with increasing concern the decentralisation of the University and the independent stance on the part of many Colleges, which in her view put the future of the University of London at risk. During her long academic career Julian published articles and books on various aspects of Byzantine history and historiography, political theory, economy and society, including Byzantine women, Venetian commercial activities in the Byzantine Empire, Byzantine perceptions of War and Peace, and, more recently, Byzantium and the rise of the Ottomans, which in a sense closes the circle from where she had started her research, only now with greater detachment and maturity. Among her major contributions is the annotated critical edition and translation of Emperor Manuel II Palaeologus’ Funeral Oration on his brother Theodore (1985), while her volume Monumenta Peloponnesiaca (1995) has been acclaimed as the most important contribution in that decade in the field of sources related to the history of the Late Byzantine Peloponnese. Julian also produced a number of volumes in co-operation with fellow-scholars, including The Letter of the Three Patriarchs to Emperor Theophilos (1997), The Greek Islands and the Sea (2004), ‘Sweet Land …’: Lectures on the History and Culture of Cyprus (2006), and a Catalogue of the Greek Manuscripts in Lambeth Palace Library (2006). In 1983 she was appointed Senior Lecturer and in 1992 Reader in Byzantine History. It is remarkable that despite her major contribution to scholarship and teaching, she was never conferred a Professorship. This is entirely due to her character and principles. She simply refused to apply for promotion. “The awarding of an academic title should not rest on a formal application and documents supplemented, but by the recognition by your own peers of the quality of your work and contribution”, she insisted. On her retirement (1993) she was awarded an Emeritus Readership in Byzantine History by the University of London. When Julian was offered a Visiting Professorship several years later, she declined, “unless, one would take the word ‘visiting’ in a metaphysical sense”! Despite her retirement, Julian remained active in both teaching and research, supervising her postgraduate students, continuing her research on Byzantine Peloponnese, and her collaborative projects on the Greek Population in Rhodes under the Hospitaller Rule, and Greek Palaeography, at the same time co-directing the Postgraduate Seminar on Editing Byzantine Texts, and giving papers and lectures in Britain and abroad. In December 1998 she was appointed Director of the Hellenic Institute at Royal Holloway. For the next decade she would work indefatigably (and without remuneration) to re-organize the Institute, establishing it as a research centre for the diachronic and interdisciplinary study of Hellenism. With the help of the College and the support of external sponsors she succeeded in expanding the Institute’s activities at the same time securing funds for the establishment of full-time lectureships, fellowships, postgraduate studentships and bursaries. In recognition of her long services to Hellenism and her major contribution to Byzantine Studies, she was granted the title of Ambassador of Hellenism by the Greek State (1999), and was honoured by former students and colleagues, headed by Professor Judith Herrin, with a Festschrift, appropriately entitled Porphyrogenita (2003). Julian Chrysostomides passed away on 18 October 2008, after a seven-month fight with cancer. She never married, but adopted the younger son of her twin brother Nikos, John, who survives her. A funeral service took place on 1 November 2008 in the Greek Orthodox Cathedral of Saint Sophia in London attended by representatives of the Greek State and the Republic of Cyprus, and a large number of her friends, former students and colleagues in Britain and abroad. Private burial took place on 3 November. A funeral oration for Julian was composed and delivered by Revd. Dr Joseph A. Munitiz at the funeral service. Obituaries appeared in The Daily Telegraph, The Times, and elsewhere. Memorial services and events to celebrate Julian's life and achievements were held at Royal Holloway Picture Gallery on 16 March 2009, The British School at Athens on 18 October 2009, the Church of St Prokopios (the Metochion of the Holy, Royal and Stavropegiake Monastery of Kykkos) in Engomi, Nicosia, Cyprus on 24 October 2010, The International Volunteerism Society “St Aemilianos” in Athens on 29 November 2010, and The Hellenic Centre in London 18 October 2011, 18 October 2012 and 16 October 2015, and the Holy Monastery of Panagia Trooditisa, Cyprus on 19 October 2014. A Memorial Concert featuring the premiere of the Julian Suite, Opus 85, composed by Phillipos Tsalahouris and commissioned by The Hellenic Institute, was held at the Greek Orthodox Cathedral Church of St Sophia in London on 18 October 2013. A tree was planted in memory of Julian on the Royal Holloway campus on 11 March 2011, in a simple and moving ceremony officiated by the Very Revd. Aemilianos Papadakis, as a living reminder of the principles and ideals that guided her life and work. To honour Julian's memory, the Julian Chrysostomides Bursaries Fund was established by The Friends of the Hellenic Institute. Donations towards these bursaries may be sent to The Hellenic Institute, Department of History, Royal Holloway, University of London, Egham, Surrey TW20 0EX, UK. Cheques should be made payable to "RHBNC, Friends of the Hellenic Institute". A memorial volume with a collection of Julian Chrysostomides' articles, entitled Byzantium and Venice, 1204-1453 and co-edited by Michael Heslop and Charalambos Dendrinos, has been published by Ashgate, the royalties of which go towards The Julian Chrysostomides Bursaries Fund. She will be remembered as a true scholar and an affectionate and inspiring teacher. Julian Chrysostomides will be remembered among her many devoted students, colleagues and friends, especially her life-long friend Joan Richmond, for her warm and generous personality, her loyalty, integrity and determination, and above all for her ‘proud humility’.